Last night I decided to make some marshmallow Top Hats, you may remember them from your childhood. I remember buying them in bags from the School’s Bring and Buy Sale many, many years ago. These are also one of Mr M’s favourite things and has been asking me for ages to make him some. I bought a packet of marshmallows and smarties last week (I already had the chocolate at home) to make them but unfortunately, the bag of marshmallows got open accidentally and I ate them…..all! So this week feeling determined that I would make them I bought more, in fact I bought two packets just in case of anymore “accidents”. 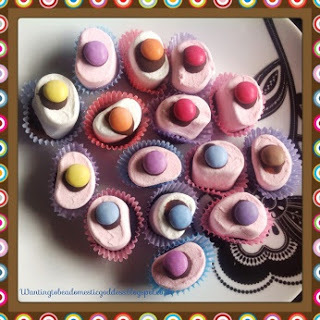 If you are feeling nostalgic I have included the recipe to make them so you too can enjoy these retro treats. Boil kettle then pour the boiling water into a pan, then put a heatproof bowl over the top of the pan ensuring it doesn’t touch the water. Break up the chocolate into small pieces (you could use chocolate chips to save you doing this) and melt. Once the chocolate is melted spoon a little into the cases and then stick your marshmallows into the chocolate cases. Dab some chocolate onto the top of the marshmallow and then stick a Smartie on the top of each one. Place in the fridge until the chocolate sets. Eat and enjoy! Although I used dark chocolate for this recipe (it was the only chocolate I had in) you could also make it with either milk or white chocolate.